Learn to play music while playing a video game! Before you know it you´ll be playing prerecorded songs like THE ENTERTAINER and GREENSLEEVES. The better you play the song, the more ponits you score. Try wailing alone on BLASTERS´ BLUES or impressing friends with BEETHOVEN´S FIFTH. 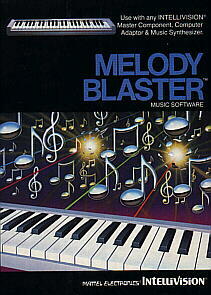 You can even become a real composer by playing original melodies into the computer´s memory. Then play the game using your own songs. Your musical imagination is your best guide to all this melodious excitement.